> Sophos > Exploits. Intercepted. Exploits are one of the main techniques used by cybercriminals to spread malware. They take advantage of weaknesses in legitimate software products like Flash and Microsoft Office to infect computers for their criminal ends. A single exploit can be used by myriad separate pieces of malware, all with different payloads. 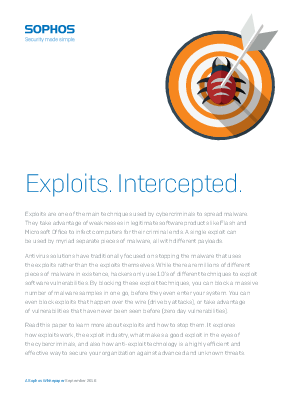 Read this paper to learn more about exploits and how to stop them. We’ll explore how exploits work, the exploit industry overall, what makes a good exploit in the eyes of the cybercriminals, and also how anti-exploit technology is a highly efficient and effective way to secure your organization against advanced and unknown threats.